Perhaps the biggest fear associated with Adventure Riding is the most inevitable; When you ride a motorcycle off-road, eventually you will fall. Usually, this is not cause for concern. Falls from an Adventure Motorcycle are usually light and injury-free, save for a bruised ego. But equipping for a fall is amongst the most important preoperational element one can employ when Adventure Riding. There are several core elements of protection that should be utilized when Adventure Riding. A ‘Sport-Specific’ Helmet, Jacket, Gloves, Boots and Pants are at the forefront of good riding gear. Within these categories, many manufacturers offer a wide range of safety-conscious gear specific to height, weight, climate, and many other key factors. A wise choosing of riding gear will help ensure you are prepared for the bumps and tumbles prevalent in Adventure Riding. Your noggin is the command center of this whole operation and as such it requires maximum protection. Some states don’t require helmets on and off the road. Given the inherent dangers present in the sport of adventure rider we recommend you ALWAYS wear a helmet. If you choose not to, however, make your skull is reinforced with metal or that your head is extra thick! Choosing a good adventure riding helmet depends heavily on what you’re looking for when it comes to size, weight, air-flow, noise dampening, and even color and design. The most common styles of helmet found in Adventure riding is either a motocross-style helmet like the Klim F4 helmet picture to the right or a Dual Sport Helmet like the Arai XD4 and the Shoei Hornet-DS. The Klim F4 helmet offers great light-weight protection and airflow and has an open visor area so that you can wear goggles. 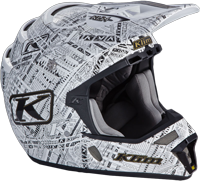 It can be found on Klim's website at Klim.com. The XD4 and Hornet-DS helmets offer rivaled protection, are a bit heavier but tend to be quieter and have a retractable visor. These helmets and other options can be found at online stores, namely Revzilla.com. Each helmet makes a compromise in one department to excel in another and therefore the choice comes down to personal preference. Like suits of armor worn by knights and warriors in the days of old, motorcycle riding suits and body armor compromise between level of protection and ease of movability/dexterity. The more protection you have, the less you will be able to freely move around on your bike while lesser protection can offer greater dexterity. The key is to strike a balance between the two and find your personal level of confidence in the amount of protection you have. Then after that you can tackle warmth and fit. 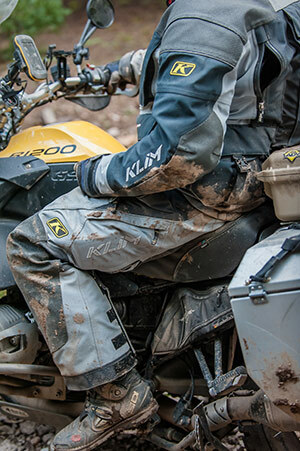 These are reasons why motorcycle apparel companies like Klim, BMW (see your local dealership), Rev'It!, and Touratech USA provide many choices in riding suits so that to best fit the individual. Some areas to consider when choosing a suit beyond what is stated above are; quality and flexibility of the protective pad inserts, level of resistance to the rain and other elements via outer chemical coating or inserted liners, ventilation and ease of access to when riding in the heat, storage for personal items or even a hydration pack, and quality of the stitch/build of the suit. Fit and cut is also an important factor. On long rides you will be spending many days wearing the same riding suit which requires your choice to be comfortable one. Making this choice can be a dificult especially for women given that most rifding suits are either unisex or cut for a male's body, which can leave something to be desired for the Adventure Woman. Rev'It's Sand Ladies Suit is a dominant contender for Women; a riding suit designed for women with female specific CE-approved armor. Boots are another essential item for adventure riding. A good dual sport boot with superior ankle protection is a must. 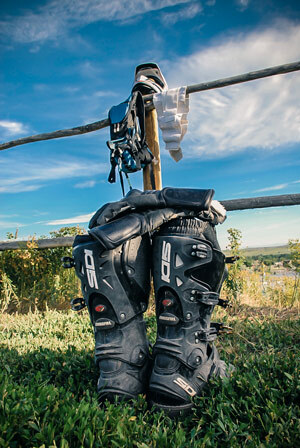 Boot companies like Sidi, Gaerne, and ALpinestar are some of the more popular brands for adventure riding and can all be found at online stores such as Revzilla.com. Take a look, buy the pair that best fits your requirements and don’t forget to spend a day or two breaking them in BEFORE you go on that long adventure ride. Gloves go “hand-in-hand” with boots as far as importance and uniqueness to the rider. Two factors to look for in a glove is the type(s) of weather it is optimised for and good solid armor protection in the knuckles. Remember when you fall the immediate response is to extend your hands out to muffle the impact. Make sure they’re properly protected. Revzilla.com also provides many options for gloves from an array of manufacturers. See what we did there with the “hand-in-hand” thing?